FAQ | M.B. FAQ – M.B. Q: What happened to that blog you were going to write while you were volunteering at the camp? A: Working at the camp turned into a 12-14 hour per day gig, with occasional panicky phone calls from colleagues in the middle of the night that prompted more work, leaving little time to blog about the situation. Other volunteers and I agree that writing about the camp is taxing and requires time to digest. Now that I’ve been back in the States for a few weeks, I am more equipped to write about the experience. Q: Where are the pics? A: Here’s an album on Flickr. Writing and photos also found on Lighthouse Relief’s blog. Q: So, what was it like? A: A living hell. First, the basics. Q: How many refugees live at the camp? A: Ritsona is home to about 800 refugees from Syria, Iraq, Afghanistan and a few individuals from Palestine. The majority of residents are from Kurdish-speaking Syria. Almost everyone speaks some dialect of Arabic, and a few families speak English pretty well, namely the Yazidis. Children under twelve comprise the largest population– about three hundred– and many live with five or more siblings and a single mom. Fathers were either victims of war or already settled in northern or central Europe. The people of Ritsona are educated, and had normal, even mundane lives similar to ours. I met engineers, barbers, doctors, architects, professors, chefs– all of the jobs necessary to sustain an economy. At Ritsona, families belong to the lower, middle and upper classes. I quickly found that everyone shared a common goal: a safe home, good school and warm dinner for their children. Ritsona is a camp that, for lack of a better word, caters to vulnerable populations: single moms with many children, pregnant women, the elderly and the disabled. This attracts NGOs that focus on these populations, such as Lighthouse Relief and I Am You. Q: How long have people been there? A: Residents have been stuck at the abandoned air force base since its opening in early March and will likely stay for at least another year. The process for asylum seekers is slow for bureaucratic reasons. Lack of information, misinformation and broken promises from the UNHCR and IOM (International Organization on Migration) take place daily. So nobody trusts them. A: A dwindling ethnic group suffering from genocide in Iraq that receives very little attention in American media. Take a few seconds to Google “Yazidi genocide” and America’s role thereof, it’s important. Q: What did you do at the camp? A: I worked under the communications director for Lighthouse Relief, which meant a lot of written and visual content production for the web and social media. But I did everything I could. Lighthouse was hardly funded so I tried to improve fundraising and communications strategies. -Greek translation for the military, ambulances, Red Cross, Lighthouse projects and locals. Attempted to translate Levantine Arabic (I’m rusty since my high school and freshman year Arabic classes). Taught basic Greek to refugees who had to make their way through Athens to the embassies. -Oriented new volunteers who were overwhelmed (we all were, all the time). -Physical labor: painting fences, moving stuff, hammering in signs, whatever. Q: Why do refugees have phones? Are they rich or something? A: No. These people have lost everything. Mobile phones and passports are the most valuable items to refugees. Everything else is just extra weight. Think about it: how do you think refugees made it to Greece? Assistance from the UNHCR? Maps and compasses? No! Through Whatsapp and related apps, refugees contact relatives and friends who have made it across borders. Routes and contact info for smugglers are shared this way. Here‘s a short video that emphasizes the value of mobile phones to refugees. Also, Greek locals and other NGOs donate phones, WiFi and other technologies to refugees. Q: So, what are the conditions like? A: Terrible. Basic human rights are violated at Ritsona. People are living under unsanitary conditions without potable water and proper toilets. About fifty vile port-o-johns line the football field where children and teens play. As of September, there are still no sanitary facilities. Women are very uncomfortable using the toilets because this space doubles as the boys’ and men’s recreational space. There are a few showers with minimal privacy that are attached to above-ground wells. The worst part is that the showers did not even exist until independent volunteers installed them in June. That’s right: not NGOs, not the Greek government, not UNICEF, WHO or the UNHCR. Volunteers from the University of Connecticut brought showers to Ritsona about three months after the camp opened. Eventually, fire hoses from the abandoned air force base were broken into and ran freely. Later it was discovered that this water contained arsenic. Residents used this water to cook, wash clothes, dishes and their bodies. But the lack of Kurdish translators and information made it impossible for everyone to know this. That same week, water from the wells tested positive for hepatitis A and caused a small outbreak. In late August, more children tested positively for hepatitis A, and an official outbreak was declared. Donors and the Greek army provide bottled water, but not nearly enough. Each person is rationed a mere 1.5 liters per day, which is less than what you and I drink, and we live indoors. Every refugee I met at Ritsona had never been camping before. They lived in cities, such as Damascus and Aleppo, and never had the need to boil pasta over a fire, or build a clay oven from mud. Water ran from faucets and they could switch on the electricity. Of the 127 tents, under half had hookups to unreliable electricity. The military refused to pay for electric for the entire camp. Large families and the elderly were given power outlets and volunteers donated fans. The inside of a tent for a family of six. They often woke up to find snakes in the tent. Luckily the snakes have not hurt the one-month-old baby yet. 104-110 degrees Fahrenheit, no wind, 30-40 per cent humidity, relentless Greek sun. Residents fill buckets of the arsenic water and dump it on each other to stay cool. Due to low humidity, water evaporates in minutes. Repeat. The Greek military provides the same rations that are given to personnel in service (service in the army is required for men 19-45 for 9-12 months depending on the duty). What you’re picturing is probably accurate: smooshy, colorless slop with things floating in it. Food is measured by calories– 666 each– not nutrients. Oily, overcooked spaghetti and old lentils in grease are frequent items. Chicken nuggets are served occasionally. Each person at the camp, including children, are given two rations per day. Breakfast is a jumbo croissant and orange juice hot from the sun. Poor diets are dangerous for all people, but pregnant and lactating women suffered greatly. Lighthouse provide a few supplements, such as bananas and cheese, but it was never enough. People often go without eating as the food is inedible. As summer progressed, more donations of actual food made it to the camp, which proved to be a huge morale booster. Families queue for hours at the warehouse for food and non-food items. The NGO responsible for distribution, Echo 100+, the group that easily had the hardest job at the camp, administered food at certain hours by tent number. Non-food items such as clothing, wash supplies, diapers, cookware, etc., were available only on certain days that were rarely communicated to the residents. Q: If arsenic and hepatitis were present in the water, why were refugees still using it? Communication throughout the camp is minimal at best. Arabic and Kurdish translators were extremely limited, there were about ten to twenty translators for the entire camp of 800. People wanted to die or already thought they were dying. Q: Is the camp unsafe or violent like I’ve seen in the news? A: No. Despite the multiple ethnic and religious groups, Ritsona has an air of stillness and tolerance. After escaping six years of war and finally making it to Greece, only to find that the borders were closed, more conflict is simply unacceptable among the tightly-knit community. By the time I arrived at the camp (June 10), families were in month four of camping. Many suffer from depression and fatigue, reluctant to waste their time on violence or harm upon one another. But tensions rose with the temperature and hunger during the holy month of Ramadan. Theft was an issue between tents and NGOs. Even the fence was stolen at Lighthouse’s daycare center as planks of wood are an invaluable commodity. Residents use them to build beds and spaces for their families. To the left is a bed. It’s not far off from what we’ve seen in photos of concentration camps from WWII. This space is nicknamed “Gitmo,” and it’s where the Kurdish families live. 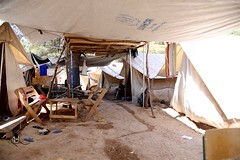 Makeshift spaces such as these are popular because they do not have the unbearable “oven effect” like the tents. Those practicing Muslim (can we please break that myth about Syrian refugees exclusively practicing Muslim?) participated in the holy month of Ramadan (June 5-July 5) including some pregnant women. A majority of residents were fasting sun up to sun down, even in the unbearable heat without water. Exhaustion, frustration and impatience spread like disease. Update, late August-early September: the camp is no longer peaceful. Ethnic groups are fighting and residents drove out NGOs, including the Red Cross and Lighthouse. They are back as of mid-September, but from what I can understand, conditions are worsening and frustration is out of hand. Supplies are limited. Interviews for seeking asylum have yet to take place.